Unrivalled speed. Unmatched airflow. Uninterrupted cleaning. Our best cordless vacuum ever for the fastest cleaning experience. * The revolutionary SpeedPro Max with 360° suction nozzle picks up more dirt with every stroke, forward and back — even along walls and furniture. Clean more in less time on both hard floors and carpets. Up to 65 min. cleaning time before recharging. Our best bagless technology now in a stick cordless vacuum. Built-in accessories always at hand for uninterrupted cleaning. *Tested against top 10 selling cordless stick vacuums >300€ in Germany 2017, using Philips developed coarse dirt hard floor cleaning test based on international standard IEC60312-1. Jan 2018. Our innovative 360° suction nozzle captures more dust and dirt faster with every stroke — even backwards and against walls — to make every move count. Our most advanced bagless technology, PowerCyclone 8, maintains suction stronger and longer to clean your house faster. The PowerBlade digital motor drives unmatched airflow — taking in more than 1000 liters of air per minute. Register within 3 months of purchase and enjoy a free 5-year motor warranty! SpeedPro Max's light weight and long reach easily extend to every corner of your home — with no cord to hold you back. With the 360° suction nozzle removed, the built-in brush head gets in where you can't. The motorized Turbo Brush snaps on with one click to whisk away pet hair from furniture. A wall-mounted base unit means your cordless vacuum is always at hand, but neatly tidied away. 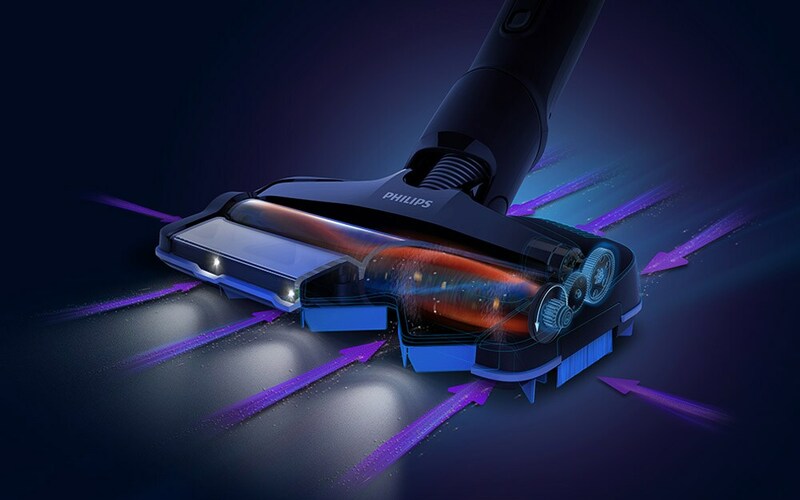 LED lights in the nozzle help vacuum under furniture and anywhere you need extra light. The charging cable attaches to SpeedPro Max magnetically for easy access. The dust bucket detaches easily and empties without any dust cloud.